Hasbro My Little Pony Big Face Pillow with Throw Just $9.97! Down From $24.99! 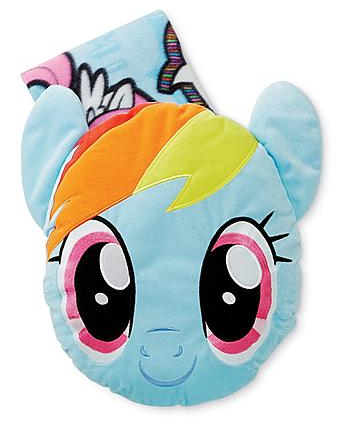 You are here: Home / Great Deals / Hasbro My Little Pony Big Face Pillow with Throw Just $9.97! Down From $24.99! Sears has this Hasbro My Little Pony Big Face Pillow with Throw on sale for $9.97 (Reg. $24.99)! Give your child’s space some cuddly charm with this My Little Pony Big Face Pillow with Throw. This adorable 2-piece set features a large cuddle pillow adorned with everyone’s favorite pony, Rainbow Dash, and a matching printed throw that can be folded up and placed in a sleeve on the back of the pillow.